How do you know what weapons your opponent is specialising in? Click on his ships and see what's on them, or open up the diplomacy screen and see what techs he has that you don't. I believe you can recieve intelligence reports if you are spying on him when he designs a new ship. Maybe there is a screen somewhere that gives some insight into his weapons and defense techs if you have a high enough espionage level? it's from Draginols Game Example: Terran Ascension. I just assumed this was an intelligence report he recieved when a new enemy ship was developed. You get this report by clicking on enemy ships, I think. Don't know whether you need a certain espionage level for it though. I believe what you have in the intelligence screen depends on the total amount you have spent in espionage at that point. 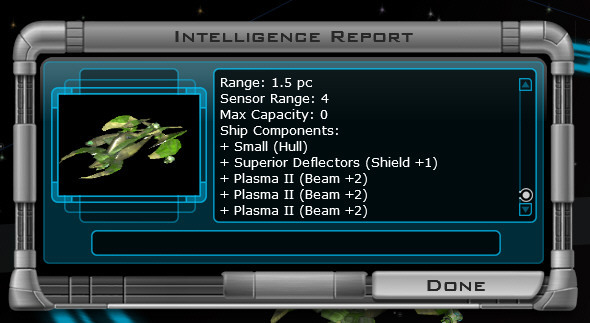 As for the intelligence report DRavisher mentions, I think you get that when you double click on the ship provided you have reached the apropriate intelligence level ("advanced" probably). At least I have a message telling me I don't have the required level yet when I tried clicking in an enemy's starbase in a recent game. But I could be wrong. As I said in my previous post, you need espionage to access starbases and planets. You can get that ship intelligence report on turn 1 if you happen to have an enemy ship in your sensor range. Once you meet an AI, you can go into the foreign relations screen under the stats tab and look at all the stats you want. No espionage required there. The ONLY things espionage gets you, I outlined in my post above. There might also be some "bad" events you can avoid if you have high levels of espionage, if that was carried over from GC1. I dont know for sure that it was, though. mavx21: I think frogboy said that you can still avoid bad events dealing with other races if you had high intelligence. I used to very efectivly steal technology, so this works 100% but the "events" are completely random. When at advanced espionage level, it says your operatives may steal tech from time to time. It also says you don't need to fund espionage anymore. I haven't been able to steal tech even though I've been at this level for a fairly long time and I know they have stuff I haven't researched. Do I need to keep funding espionage to steal tech or do I just need to wait longer? Anyone know? It takes a "LOW" level of espionage penetration to get the ship data screen that someone posted above, and you get it simply by double clicking on a ship you want to look at. Espionage works as a cumulative effort; your spies and contacts build up a network over the span of many turns. Dumping a whole lot of money into it at once doesn't work very well. Instead set a low funding level early and let it build up; your level of spying will steadily increase through the game. Technically you don't have to fund espionage to steal tech, you just have to invade a well-developed enemy world and you have a chance to steal some that way. Similarly, with a high enough espionage level you can click on enemy planets and get a data screen for them. You can see what they are currently researching as well, which can give you an idea what sort of weapons and defenses they are aiming for. I do as Kryo suggests. Usually the AIs share tech and when they all keep offering me the same weapon tech I can somewhat guess that's what they're using. Same with defense - I can make a reasonable pick at what weapon type to use based on what defense techs they all continually offer. I follow up by checking some of their ships. I usually build some tiny sensor loaded ships to monitor the fringes of my empire, and with their range I can usually scope out some enemy ships to see what they're building too.